In the summer of 2003, I began the search for my first classic car. I knew deep in my heart that I wanted this car to be a Gremlin. The first time I saw a “real life” Gremlin was at the Hershey Show 2002. The rest was history. I started my search by walking down the obvious avenues; newspaper ads (I must have been dreaming thinking I would find one of these cars in Pittsburgh) AMC car clubs, AMO newsletter and so on. I started noticing a few Gremlins. I got excited about any car I saw in these ads; even if half the back was missing and they were located 400 miles from Pittsburgh. Fortunately, my boyfriend steered me in the conservative direction. Dave’s recommendation was to look for a Gremlin that was in solid condition. Though I might be paying a little more for the car, in the long run, it would most likely end up being less expensive (new body work and paint $$$). Several weeks later, I got word about a Gremlin parked in a little car lot outside of Indiana, Pennsylvania. My friend warned me that 3 weeks had passed since she saw the car and didn’t know if it was even still there. Dave and I were willing to take the chance and started our road trip to Indiana, PA. The car lot had several cars, but the Gremlin was nowhere to be found. Dave continued to search behind the lot. Within a few minutes Dave yelled “I found it”. There it was, the little blue Gremlin X. Not knowing if it was sold, or as Dave said “maybe they were embarrassed to have it on their lot”, I took down the phone number and called the next day. The salesmen reassured me that it was for sale and then quoted me a price. I was happy. Dave and I decided to go to the car lot that evening to look over the Gremlin. When we arrived the car was there to greet us. We looked her over and took her for a ride. The Gremlin had hardly any rust underneath the car and even looked cleaner than my current car. To top it off, it only had 17,000 miles. I was sold. After some negotiating, the little blue Gremlin X was coming home. 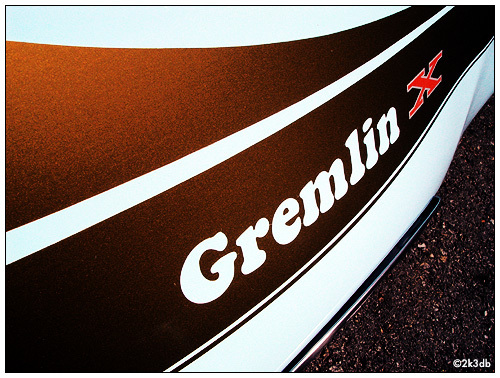 I was a new proud owner not only of a classic car, but one of the coolest cars made, the Gremlin. The Gremlin X arrived via flatbed the following week. It was home. Even though the car was in very good condition, it still had some minor issues that needed to be fixed. My main goal is to keep the Gremlin as much as original as possible. I am anxiously waiting to get her back in tip top shape (with, of course, the help of Dave). 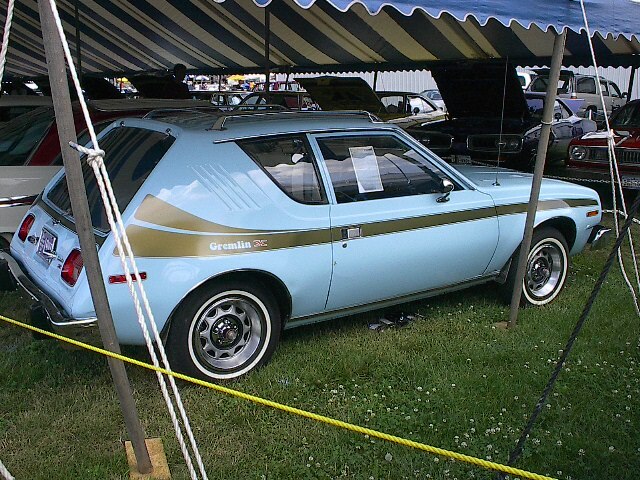 The Gremlin X was selected to be a part of the 2004 Chrysler at Carlisle “Survivor” Show. There were a total of 40 cars. This was a great honor for me and I’m sure for many AMC owners. It was a super opportunity to get some exposure for AMC (even if they are considered DaimlerChrysler “stepchildren”). I had an obligation to AMC. 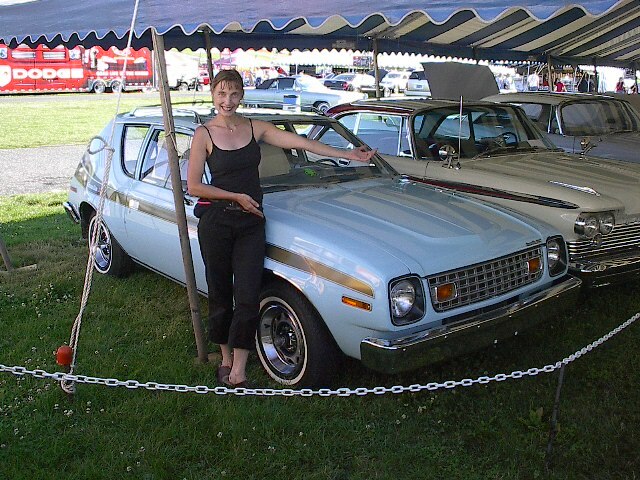 By bringing my little blue Gremlin to the Chrysler Show, I knew I was contributing to keeping AMC ALIVE in automobile history. 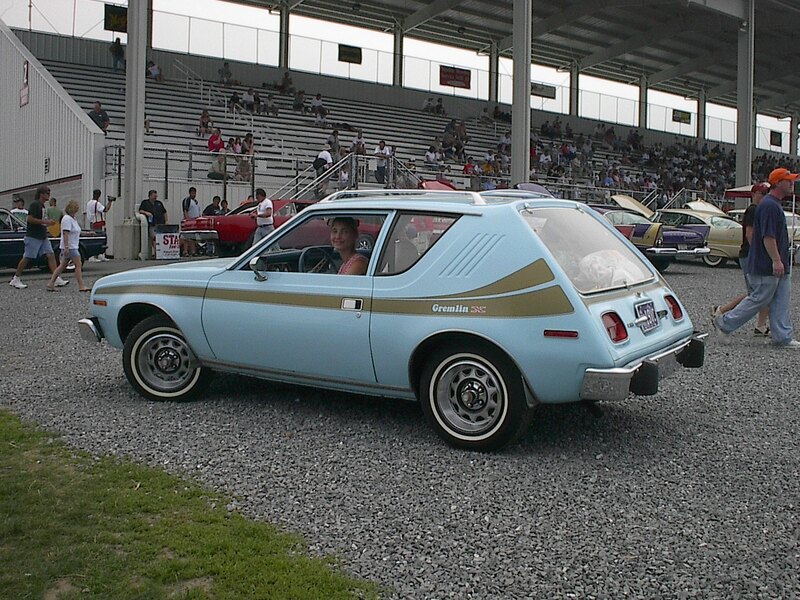 Overall the Gremlin got great reviews and of course we can’t forget the few usual AMC bashers (if these individuals knew their automobile history, I think they would be embarrassed by their remarks). Let’s not forget, AMC was definitely ahead of their time.